Salamanca city is in western Spain and one of the most important things to see is the University. Let me give you a rough idea where is the location of Salamanca city, it is about 200 km away from Madrid and quite near the Portuguese border, about 80 km. The city was declared a Unesco World Heritage site in 1988 so you will expect a lot to see and to do in this city too. We started our Salamanca city walking tour with a local guide who brought us to the important sites and the hidden gem. The guide showed us the sandstone with printed signs, each representing the person who made the sandstone in ancient time. This is the way to manage quality control. The color of the sandstone is kind of yellowish and golden hence the city is also known as the “Golden City”. You will also see the wall is uneven because ancient people use the brick wall to sharpen their swords. Not many cities have two cathedrals but Salamanca has two cathedrals, an old one and a new one. The Old Cathedral was built in the 12th century in the Romanesque style and closed to the public but will only open during a special occasion. Statue of Father Camara, ancient Bishop of the city of Salamanca, Castile and Leon. The old and new cathedral are interconnected. The new Cathedral was built in Gothic-Baroque style and with an interesting facade. There are several interesting things you can spot in the beautiful facade of the Salamanca Cathedral; the astronauts, the rabbit, and the dragon eating ice-cream. These three are the important sculptures in this facade of Salamanca Cathedral that you need to look for. The famous astronaut carved in stone in the Salamanca Cathedral Facade. The sculpture was added during renovations in 1992. Jeronimo Garcia, chief restorer chose the astronaut as a symbol of the 20th century. As you can see the color of the rabbit is different from other sculpture. It is because visitors will rub the rabbit for good luck. Don’t forget to rub the rabbit. The dragon eating ice-cream is also a newly added sculpture under the recent restoration in 1992. According to the Jeronimo Garcia, chief restorer; the dragon represent the students. I don’t have the picture here but you can see how mischievous the dragon look like, I can totally relate that it represents the student. The University of Salamanca founded in 1218 and the oldest university in Spain. It is also one of the world’s oldest university follow behind universities after Oxford and Bologna. When you visit Salamanca to check out their university is a must. The statue is the famous Spanish lyric poet, theologian and academic and very active during the Spanish Golden Age. It is located in the complex of Salamanca University. 9. It turns 800 years old! There is a clock near one of the beautiful facade buildings that display how many days until it turns 800 years old. When I was there on 24 December 2018, it still has 8 days to turn 800 years old. The building is considered one of the most beautiful universities in the world because of the beautiful facade. The frog has become the lucky charm in Salamanca city, you see it everywhere. Tee-shirts, fridge magnets, key chain, socks print and many more. This little cute train will bring you to the historic center of Salamanca with a pleasant 30-minute tour. There is an audio guide to help you learn interesting details of the places on the route. Only at 5 euro. Do look out for the Victor academic symbol on the walls of university buildings in Salamanca city. It is a sign of recognition to the graduating students. This is another interesting architecture found in Salamanca city. The building was built at the end of the 15 century by a knight of the order of Santigo. It is decorated with more than 300 scallop shells since the scallop shell is traditionally associated with St. James- Santiago. One of the iconic dishes you see in Salamanca is the Hornaza, it is found in most bakeries and cake shops. The characteristic of the Hornazo is it has a diagonal grid pattern on top of the dough. Inside you find different layers of meat, such as loin pork and chorizo are the main, sometimes eggs and cured ham or bacon are used too. Our walking tour end at the Plaza Mayor which allows us to see the light-up and also do some shopping. Plaza Mayor is located in the center of Salamanca and used as a public square. You see Spanish baroque style of architecture and plenty of tapas restaurants and cafe, jewelry shops and ice-cream stores. This would be one of the most stunning Plaza Mayor that I visited in Spain. There is plenty of thing going on as it is near the Chrismas day. The crowd was starting to get huge as it was still early when I was there, before 7 pm. Spaniard usually comes out at around 8 plus and stay till quite late. I heard they don’t sleep too early, usually after 1 pm even on the normal days. In Spain, you find there are many Plaza Mayor all over Spain. Saw one at Madrid but this one in Salamanca look really stunning. 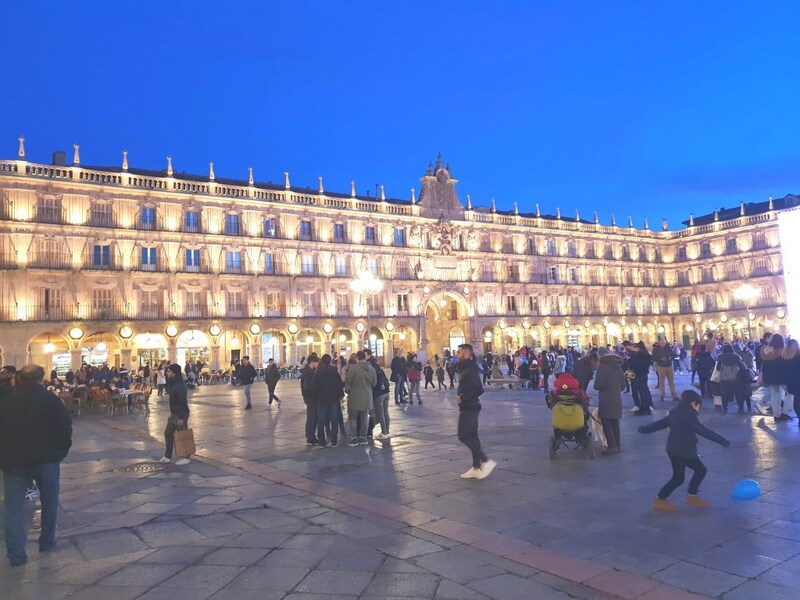 Plaza Mayor is like the Spanish “living room” for people to get together, a place for social activities, cultural and commercial. The layout usually is square or rectangular with semi-circular arches and beautiful balconies. Ancient time, Spaniard use it as the public justice, bullfights, tournaments but now it is the place to get together, eat, shop and meet people. Our bus stopped in front of this building and I was immediately attracted by the intricate glass works! It is now a museum to display masterpieces artwork from the 19th and the 20th centuries. Originally the building was a private palace. Salamanca city in Spain is famous for its University, one of the oldest in the world. In the facade of the university, there is a frog on top of the skull and if you are able to spot it, it brings you good luck especially for students who will get good results. There are also other cute sculptures at the Salamanca Cathedral facade, such as the astronaut, the lucky rabbit and the dragon eating ice-cream. When I think of Salamanca, these are the things that I would remember about the city. What is your favorite part of Salamanca City? And why? Thank you so much for this fabulous post! I have Spain as a must visit destination when I am able to travel and I totally enjoyed this fabulous post as now I have some must visit places on my list. The pictures are amazing and I love the rich history for sure. Cannot wait and thank you! Spain is truly a must visit place in this planet earth! There are so many things to see in each region in Spain. I am speechless arriving in each city! wow! Looks like such a beautiful place to visit! Your photos are beautiful! Salamanca Spain is truly a beautiful city to visit and one of the selling point is their Univesity. It is the first University in Spain and one of the oldest in the world. I’m fascinated by the fact that you can still see where they used to sharpen their blades. It’s a good thing it’s been declared an UNESCO site. Lol, I love looking at details and it was pointed out by our city guide in Salamanca. I absolutely love all the historical facts. I would have never known about the sword sharpening. Makes me want to visit even more. If you look at some of the sandstone on the wall, there are special sign- look similar to triangle shape – to indicate who is the person responsible making these sandstone. The signs look like some Egyptian sign, pretty cute. I was told this is for quality control and to check back who made these sandstones. Thank you for sharing us the Salamanca beauty! When I have an opportunity to visit Spain, I would love to add this to my itinerary. Very interesting and educational!